Wendy listed 20 more jewelry tutorials. 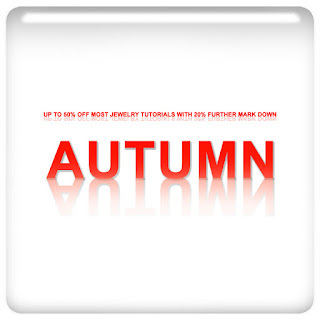 Abby listed 5 more jewelry tutorials. And more tutorials to be listed along the way, so do check back! UP TO 50% DISCOUNT: I have gotten most of the guest artists to join me for the promotion - most items on de Cor's instant download site are having up to 50% discount off. 20% FURTHER MARK DOWN: I've gotten most of the guest artists to also join me for the further mark down promotion, too - Hunt for item with a little yellow % icon, check out 3 or more of those to enjoy 20% further discount of all item marked with "%" icon!